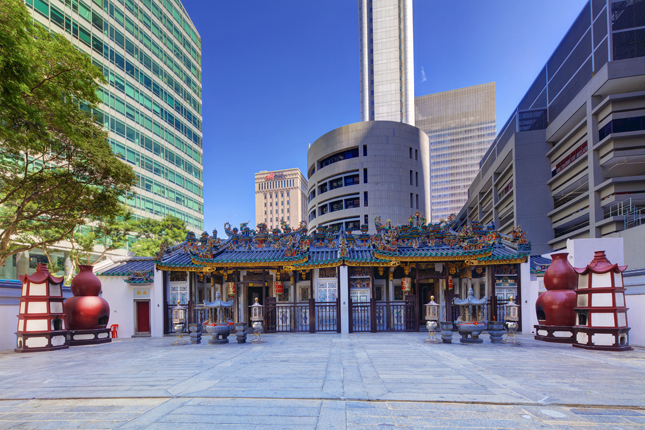 Dwarfed by modern skyscrapers in the heart of the Central Business District is one of Singapore’s oldest Chinese temples, Yueh Hai Ching Temple (粤海清庙). 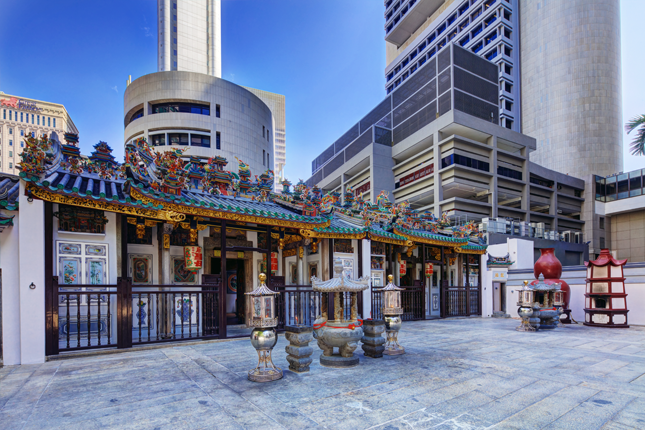 Also known as Wak Hai Cheng Bio in Teochew, the temple serves as a reminder of the contributions of Teochew Chinese pioneers who arrived in Singapore shortly after the arrival of the British in 1819. Teochew immigrants hailed from the Chaoshan region in South China, located in the easternmost Guangdong Province and bordering Fujian Province. When they first arrived in Singapore, the Teochew immigrants set up a small wood-and-attap shrine on what is known as Philip Street today, and offered prayers in thanksgiving to Mazu (妈祖), Goddess of the Seas, for her protection and blessings during the treacherous sea voyages from China. This explains the name of the temple, which in English means ‘Temple of the Calm Sea of the Guangdong (Yue) People’. It is believed that a man named Lin Pan (林泮) built a proper temple on the site of the makeshift shrine in 1826. Like other places of worship in Singapore, the temple also functioned as a social centre for immigrants. Ngee Ann Kongsi (义安公司), which was established in 1845 to look after the religious needs and welfare of the Teochew community in Singapore, took over the management of the temple the same year. During its incipient years, the Kongsi was led by Seah Eu Chin (佘有进), a wealthy Teochew pepper and gambier merchant. Yueh Hai Ching Temple was subsequently rebuilt between 1852 and 1855 with funds collected from the growing Teochew community in Singapore. Some building materials were specially imported from China. The temple now comprises two prayer halls: the left wing of the temple, Tian Hou Gong (天后宫, ‘Palace of the Heavenly Empress’), is reserved for the worship of Mazu; Shang Di Gong (上帝宫, ‘Palace of the Heavenly Emperor’) on the right is where the faithful honour Xuan Tian Shang Di (玄天上帝, ‘Heavenly Emperor’), the patron deity of the Teochews. As both prayer halls look identical, Cantonese devotees nicknamed the temple Mah Miu (孖庙), which means ‘Twin Temples’. Yueh Hai Ching Temple was built in the standard three-hall layout of traditional Chinese temples, with covered courtyards between the entrance and main halls. Its Teochew-style roof has a relatively straight ridge. An outstanding feature is the set of delightful three-dimensional sculptures on its roof, which depict scenes of towns in China, as well as mythical flora and fauna that represent longevity, posterity, and strength. The exquisite images of dragons and other ornamentation on the temple’s roofscape are crafted using a special method known in Guangdong as qian ci (嵌瓷). This technique is commonly called jian nian (剪粘), which literally means ‘cut and paste’. Colourful ceramics were carefully cut and trimmed into smaller pieces, and then pasted to create beautiful mosaic figures. Such decorations can also be found on the roofscapes of Former House of Tan Yeok Nee, Thian Hock Keng, Former Keng Teck Whay Building, Hong San See, and Lian Shan Shuang Lin Monastery. The temple’s interior is replete with intricate carvings depicting scenes from popular Chinese legends and folklore, including ‘Eight Immortals Crossing the Seas’ (《八仙过海》), ‘Ruse of the Empty City’ (《空城计》), and ‘Madam White Snake Steals Lingzhi Grass to Save Xu Xian’ (《白素贞偷灵芝草救许仙》). In 1899, Emperor Guangxu of Qing China bestowed Yueh Hai Ching Temple with a scroll on which four calligraphic characters – shu hai xiang yun (曙海祥云) – were elegantly written in his own hand. The phrase can be translated as ‘moving seas with peaceful clouds above’; it conveyed the Emperor’s blessings to the local Chinese community, in return for the temple’s contribution of 6,000 taels of silver for the flood relief efforts in Shandong, China. The four characters were carved on a large wooden plaque, which is now prominently displayed in the temple. Besides Yueh Hai Ching Temple, the only other temple in Singapore to have received a similar imperial favour is Thian Hock Keng. Yueh Hai Ching Temple underwent extensive restoration between 2011 and 2014. This won the temple the Award of Merit in the UNESCO Asia-Pacific Heritage Awards for Cultural Heritage Conservation in 2014. Puppet shows are still performed at the temple in honour of the deities on certain festivals. Today, the temple remains a popular place of worship for the local Chinese community.